This new traditional cast iron 2 column radiator is an exact copy and quality of the original cast iron radiators of the Victorian age .All our Victorian column radiators are 945mm high 70mm in depth and are supplied in various lengths depending on heating output required.This traditional column radiator is supplied in a primer finish for on site painting or we can have the cast iron radiator pre-finished to a selection of paint finishes as a special order ( please allow 3 weeks) Each period radiator produces 84 watts of heat output per section. Please note a joining key is required for radiators over 600mm wide, please call for advise. * Supplied in prime or painted. * 10 colours to special order. 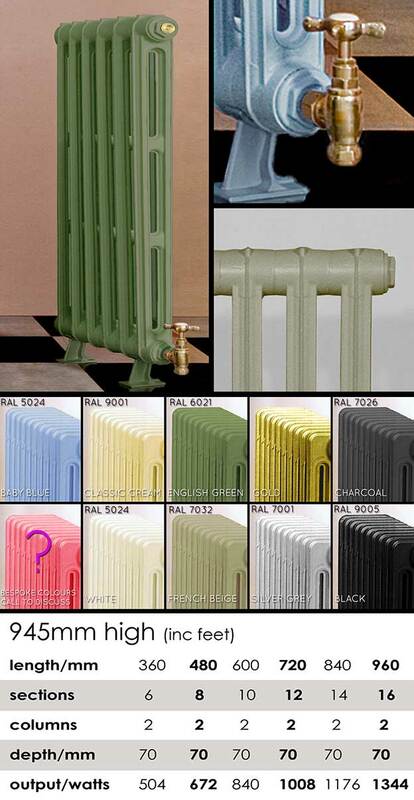 * Bespoke radiator colours available.